The colours in the garden are heart-stoppingly beautiful. The glory vine has huge rose-pink leaves and next to it are four crabapple trees, all spangled in gold and around the corner the pomegranate tree has five beautiful fruit (its first crop). 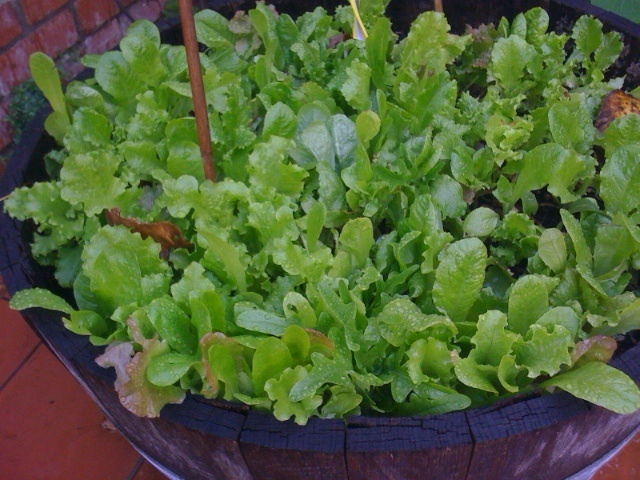 My barrel of salad leaves is still producing exquisitely tender leaves that I harvest with scissors. I cut the outside leaves and each plant continues to grow. 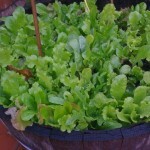 In five minutes I have a bowl full of frilly or crinkled or smooth leaves, each one around 10cm in length. Such a perfect salad just needs a few drops of extra virgin olive oil and a few flakes of salt. I add no acid at all. The olive oil that was given to me last month by Lina and Tony Siciliano is very, very special. Have been tweeting quite a bit and I think I am enjoying it. Still not sure about the etiquette of retweeting, or even how to do it to best effect, but am learning all the time. I do notice the blanket tweeting of political figures – is this in case they miss our attention by the blink of an eye, or the click of a finger? Saw a great bit of footage after the first episode of Masterchef that followed the fortunes of several former contestants. One was Fiona Inglis who is a kitchen specialist at Findon Primary School and she is doing a great job and the footage showed the children enjoying themselves in the garden and in the kitchen. I also attended a working bee at Stanmore Primary School near to Sydney airport, where thirty volunteers who work for one of our partners GPT Group had come to help create the beds for the kitchen garden. The children had planted fruit trees, and enthusiastically showed me where they would free-range their chickens. In a few hours the volunteers had done an amazing job and the shape of the beds could be seen, where once had been bare ground. We have been corresponding via Twitter with the Edible Schoolyard in Berkeley California. Their schools are just starting up and soon we hope to create connections between the students themselves. I have planted out crops for the winter months and will now sit back and watch, and scare away the white cabbage butterflies and the snails. I have a mixed arsenal. Copper ribbon along the edge of the bed, coffee grounds regularly sprinkled around the seedlings, twirly dangling things that are shiny and that scare the birds, and pet-friendly pellets near to the tiniest broccoli and spinach seedlings. I have planted some chicory, some Tuscan kale, brussels sprouts (my first ever), more carrots, and small cauliflower and sprouting broccoli. And I also have planted more of the beautiful sweet peas that I bought a year ago at the Chelsea Flower Show. They were spectacular and so highly-scented. It has rained on and off all day and such weather always makes me think of soup. At dinner at Andrew McConnell’s Golden Fields a few nights ago a favourite was the chicken congee, a Chinese rice porridge that is a popular breakfast or anytime pick-me-up soupy dish and absolutely delicious. Last week I made a pot of minestrone. This week it will be leek and potato, with the extra bonus of a large quantity of parsley to make it apple-green. I pick the parsley, give it a quick wash, then plunge it into boiling water for less than a minute, drain it and then blend it with the leeks and potato. And maybe the week after I will make my version of caldo verde that combines torn silverbeet or kale leaves, with potato and pieces of pork or spicy sausage. I am really enjoying this autumn weather!